Conceived and founded in 1980, Manchu Wok grew into a national chain across <?xml:namespace prefix = st1 ns = "urn:schemas-microsoft-com:office:smarttags" />Canada and into the United States over the next nine years. Ownership changed in 1989, and expansion continued with a focus on the United States. 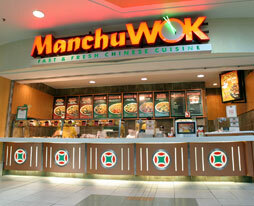 Manchu Wok now has more than 200 stores, of which more than 70 percent are franchised. 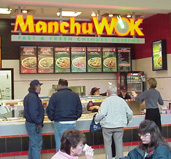 Manchu WOK has a well-established brand name, reputation and track record - boasting sales of $165 million annually and named Forbes #1 Chinese QSR franchise for five years in a row. Our experience and knowledge of this market span more than 25 years. Today, the hottest segment among Quick Service Restaurants is 'ethnic' cuisine. And the hottest of the hot is Chinese. These days, area development opportunities are rare and right now Chinese franchise 'chains' are underdeveloped. Here's your opportunity to develop an area that best suits your business plan, virtually anywhere in North America. Take control of an exclusive, protected franchise area in a growing market segment. Control future development and your long-term business growth in the market you choose. Leverage your existing overhead and strengthen your position with landlords and suppliers. We also have a "Seed Store" program whereby we will sell you, our new Area Partner, corporate stores within your area. We are aggressively pursuing growth in street front restaurants, malls, airports, hospitals, entertainment venues, and military bases. Manchu WOK offers several exciting business concepts providing new growth vehicles as your existing concepts are fully developed. Our traditional mall food-court restaurants are typically 400 - 500 sq. ft. in size. These have a long history of success as profitable businesses. The size of our new street-front restaurant concepts ranges from 1,200 to 2,000 sq. ft. offering sit-down dining as well as take-home, delivery and catering. To learn more about the Manchu WOK Chinese food franchise opportunity, simply complete the form below.